Parker Hannifin Skinner Solenoid Valve P/N 7321GBN76N00N0C111C2, 24VDC, 1-1/4 NPT, NC, 5-230 psi air, 5-230 psi water, 5-230 psi oil, Buna N Seals, Brass Body. Cv IS 19.3. 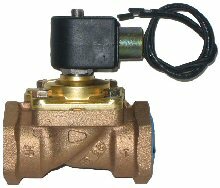 The Series 7321G is a pilot operated 2-way solenoid valve valve with a minimum pressure requirement. The Skinner 7000 series valves use laser welding for perfect fit of the plunger and core tube for less wear and significantly longer life. Parker part number 7321GBN76N00N0C111C2.